At the recent Design Jam Oxford I was introduced to the Gamestorming book and have been pretty much obsessed with it ever since. Given the slightest opportunity I have been putting its ideas to use and one fantastic success was at a recent event in Nottingham in the UK. 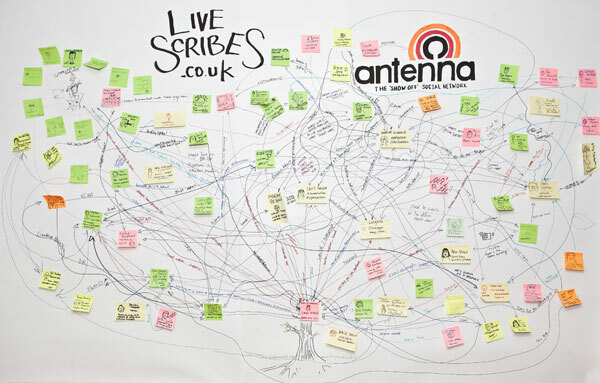 We are a group of artists called Livescribes and we have only just launched ourselves into the world of Visual Thinking, Graphic Recording and Graphic Facilitation. When you begin a new venture – I quit my regular 9-5 web job to do this – you never quite know what might happen. 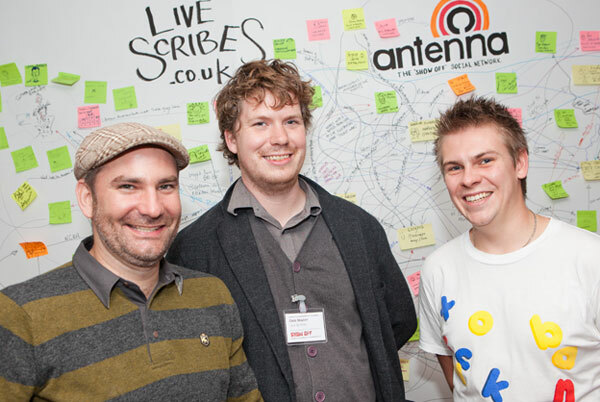 The first event we were due to attend as Livescribes was called ‘Show Off’ at Antenna in Nottingham. Antenna is a studio and office space for creatives based in and around Nottingham. We decided one thing we wanted to do to show the people there we do things differently was to instigate the ‘Low Tech Social Network’ straight out of the Gamestorming playbook (page 105). We would ask people to take a Post-It, draw themselves, write two things about themselves on it and ‘upload’ themselves to our piece of paper. The event had businesses associated with Antenna as well as visitors all with stands showing their wares in a large, and very nice, bar area which forms the main networking spot within the building (it does coffee and beer). We unfurled a giant piece of paper and masking taped it to a large wall on a slightly raised area in the bar area. And after politely negotiating with some hairdressers to move their stand so we could be seen awaited the first arrivals. As it was the hairdressers next to us became our first additions to the social network. We even drew a cartoon of them cutting hair. They went from a bit put out at moving to our new friends. Already the power of the social network was having an effect. We got everyone we could to ‘upload’ themselves and draw connections to other people. You can have a look at the final result on our site here (I have used the cloud zoom JQUERY plugin to create that effect incase you’re interested). We managed to collar nearly everyone who walked into the room over the course of the day. Not only is this an excellent ice breaker its a fantastic way to get talking to potential clients at an event like this. Once the penny dropped that we were not trying to get their credit card details for some ‘New Facebook’ people smiled, grabbed a sharpie and connected. And once the network had grown into a significantly large collective artwork it became one of the main draws of the event. My favourite moment was when I accosted a thin slightly stressed individual who was inspecting the work. After giving him the spiel and placing a Post-It and pen in his hand he got to it. Although one odd thing that struck me was, as I was speaking, he looked over my shoulder and made that sort of ‘no it’s ok’ hand gesture to someone. As the gentleman uploaded I noticed he wrote ‘politician’ on his Post-It, I looked around to see a coterie of sharp suited business delegates and political types holding clip boards and a few photographers all looking at us. It turned out I had button holed the head of Nottingham City Council. When he asked me how he should cut £20m from the city budget I immediately thought of the ‘Anti Problem’ Gamestorming session and was about to suggest we figured out how to spend £20m and then not do that – but he was whisked away by his army of followers before I could get him to a flip chart. The goal for each team is to come up with an answer to a provocative question and write/draw it up on the back of a napkin. Number of Players: Teams of 3. (See strategy section for discussion of different team sizes.) No limit to the number of teams other than what the organizer wants. Duration of Play: TBD by organizer. Minimum amount of time recommended: 10 minutes per team per question. Game is played in teams. There is at least 1 problem statement/open-ended question per game session. Each team writes and/or draws their answer on a napkin. Each answer appears on one side of the (folded) napkin. Players write their names on the other side of the napkin. Optional: Players may enter as many solutions as they want, however, each submission has to be from a different team. Optional: Each team must be comprised of at least 2 people who have just met or are just meeting. To introduce people to each other and/or to facilitate networking amongst them. 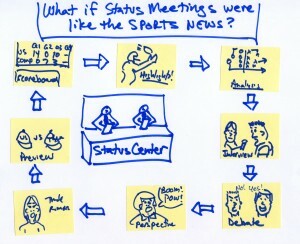 To provide a fun, competitive way to brainstorm. To turn the reception for an event into an experience that people value as part of the overall experience. 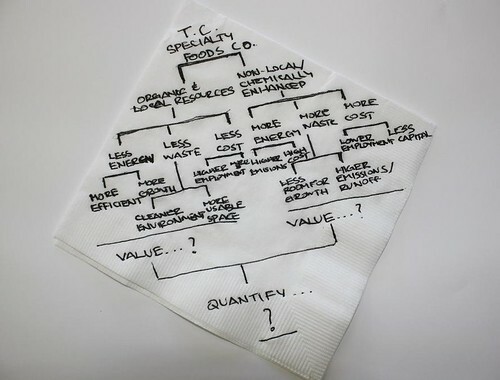 The back of a napkin is already associated with Aha moments and inspiration. Its informality helps combat people’s instincts towards worrying about whether they can draw, have the “perfect” solution to the question, and other worries that can crop up if we were to use something more formal. It’s a good idea to reinforce this in the introduction to the game by encouraging teams to be as practical, whimsical and/or out of the box as they want, and, if winners will be named, by having categories that include playful ones. Question strategy: define a question that’s open-ended and requires more than a couple of words to answer. Keep it relatively short and clear. Don’t worry that the question is too “big” in terms of its scope. This game is meant to inspire conversation and ideation. an experience they’ve had in common, such as being a parent or living in the same community. Team size: you can choose to set the team size to be exactly n players, no fewer than n players, no more than n players, or n to y players. I recommend that the numbers be somewhere between 2 and 6. If you’re running the game at an event where people decide to play or not, going with the “n to y players” would work best. This is because people are playing and networking at the same time, and if 4 people want to play in one place and 2 in another, for example, there’s no reason they shouldn’t be able to. In an environment where it’s important to you that everyone plays, setting team sizes more precisely might work better. 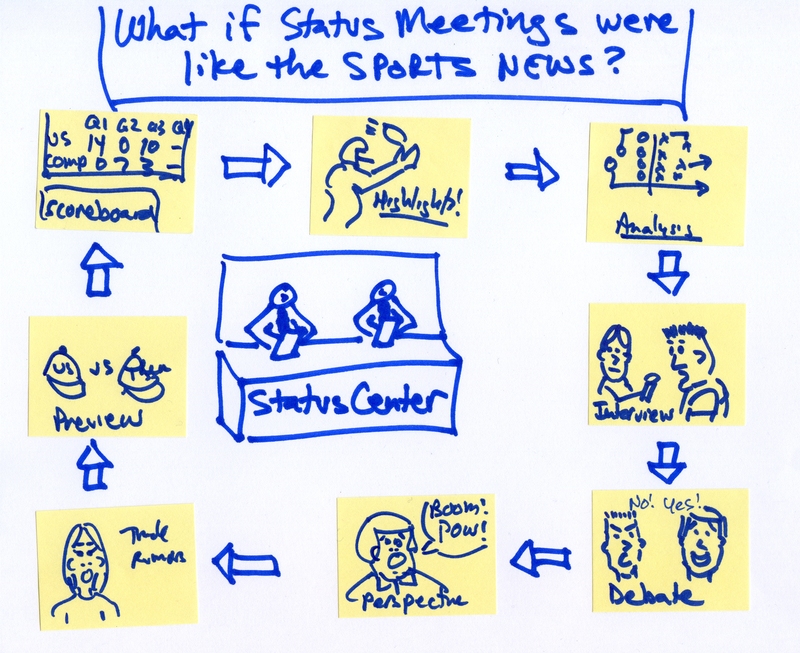 With regard to team formation, you can go with an unconference approach and have multiple questions and have people gravitate to the question they want to answer and find others to team with, or go with something more defined. A napkin that’s around 5″ x 5″ in its folded form works well. It’s better to get ones with a smooth surface so it’s easier to write on. Gel pens work well, fyi, if you’re providing pens. If you are playing the game with multiple questions or in a large space, consider having a host/facilitator at each question’s station to explain the game and answer questions. I recommend having a flip chart or other large-format paper hanging on the wall and having players tape their napkins to that. Tell players the timeframe in which the game will be played.